Márta Ehrlich was born on September 27, 1919, but since her birth was not recorded till the following day, her birthday would eventually be celebrated on the 28th. It was József's idea that he and Matild should keep a diary for Márta, and they got a hardbound quadrille book to do their recording in. On the title page József wrote, in carefully-drawn block letters, the eloquent if uncharacteristic-for-him sentiment ISTEN NEVÉBEN KEZDEM MEG: In God's Name I Begin This. For the first three months of Márta's life virtually nothing got recorded; during the next three months, though József and Matild would each make many Diary entries, their observations were in no way unusual or extraordinary for happy new parents with a firstborn child. "Tomorrow you will be six months old," József might remark. "Let's see how much you developed since last I wrote in this book," and he would go on to describe what Márta ate for lunch, or how much she enjoyed rocking herself back and forth on all fours. Matild might mention taking the baby in her buggy out for a walk every day, and how Márta loved going out just like her mother: "Now all day long you say 'bye-bye, go bye-bye.'" "Márta was our whole life at that time," Matild would one day add. "We loved her very much, and watched her grow and develop beautifully." In November 1919 the Romanians withdrew from thoroughly-plundered Budapest, and Admiral Horthy led in his army, telling the Lord Mayor that "we shall forgive this criminal city." The Budapest Spirit was the White Hungarians's whipping boy: Bolsheviks, organized labor, Freemasons, and Jews were all prominent on their hit list. Miklós Horthy, admiral in a country that now lacked both navy and seaport, was named Regent for the King who remained in exile—and Karl was forcibly kept there too, even being shot at by Horthy's troops when he tried to reclaim the Hungarian throne. For awhile, ironically, the situation in Romania was different. Rather than agree to the Peace Treaty's minorities clause, which explicitly obligated Romania to recognize its Jews as citizens, Prime Minister Bratianu resigned; but a conciliatory coalition then took power, signed the treaty and agreed to observe its provisions. However much the Transylvanian Jews might despise Romania and long to be reunited with Hungary, it must have seemed (could it be possible?) that things might actually be working out, after all, for the best. Then in March 1920 King Ferdinand dismissed the coalition and had it replaced by a strong authoritarian government, one which rejected social reform and denounced the opposition as "Jewish-dominated leftists," alien and pro-Communist. In Transylvania there was no immediate change in Jewish status, though the government and bureaucracy had undergone wholesale Romanization. But the Transylvanian Jews, with their historic and cultural ties to the hated Magyars, were suspected of "irredentism," and their lives and activities were very soon to be restricted. 1920 April 10. Yesterday you were a naughty little girl. Sorry I have to say such a thing of you my dear. We went for a long walk, the three of us, and by late afternoon we got home. As soon as we stepped into the house, you started to scream and cried as hard as you could. Mommy picked you up and took all your clothes off to see what's wrong, found nothing. She tried to feed you, but you wouldn't take anything, so back you went in the buggy and we had coffee and cake, and you just hollered while we ate. So out we went for another stroll in the park, and lo and behold our daughter stopped crying and started to laugh and be happy. Well, wasn't that naughty? 1920 August 11. We came home from the country resort,‡ its name is Kolozs and it has a natural salty lake for bathing. You are one kilo heavier, but it seems you grew rather than gained. You are tall for your age, and developed a lot while in the country. You understand every word spoken to you. You are a little timid, not afraid of people but of things. For instance you are afraid of shoes. It happened in the country yet, you were sitting on the floor and glanced down at your feet, when you saw the shoes on them you started crawling just as fast as you could, then stopped to take another look and got startled again and tried to run away from them. "We did very well," Matild would say of their millinery business next door to Matthias Corvinus's birthplace, "but the Romanian city officials who were officiating this part of Hungary were a mean lot and couldn't let us alone. They though no one who wasn't born in Transylvania belonged there, and the police started to come to let us know it, hounding us until [József] started to give them money which seemed endless blackmailing. A large part of our earnings went to the blackmailers, for bribing several of them just to let us live, until [József] was seeing we couldn't live this way much longer." In later years it would always be said that the Ehrlich millinery had been "lost." 1920 September 27. This is a very pleasant date for us Mártuka, today is your first birthday. All that happened with you in a year we tried to record here for us all. We are very satisfied with your progress. You are tall and very pretty, and mostly very bright. Once somebody asked if you were at least two years old? although you were not even one year old at that time. We hope we can give you the upbringing we both wish to. It is very hard my dear, lots of difficulty lies before us. You will think it was impossible when you are old enough to read this book. Hope you never will have to know the terrible things that are going on in this world today. We had to move in with your Aunt Fáni and Uncle János, and all we have is a bedroom, and we have to use the kitchen together. But we are not discouraged, we know it will be different and better some time. Mártuka, you keep us going, and we are hoping we can keep you protected always from unpleasant things. Both of the Fruchters made entries in Márta's Diary: "I must add to your nice remembrance," Fáni wrote, "so when you are old enough to read all this I am remembered also." And Jani hoped that "when you are grown years later, and you will read this book, you will remember your old Uncle Jani, if not personally, then from hearing your Dad and Mommy talk of me to you." Domestic help was inexpensive and the Ehrlichs hired a nursemaid to look after Márta while Matild and József were at work. Matild's younger brother Jenő and at least one sister (probably Margit, a dressmaker) had a "big ladies's tailoring shop and salon" at the Kun house, with twenty people working there—now including the Ehrlichs, doing millinery. József's job prospects were otherwise bleak. "He couldn't find work because he wasn't born in Transylvania," Matild would recall. "He was declared an alien and eventually would have to leave the country where I was born." 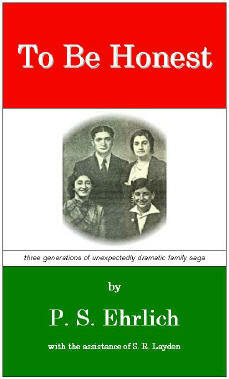 But even were they to return to Budapest, things were not likely to be any better. Five days before Márta's first birthday, the first major anti-Semitic law in postwar Europe was adopted in Hungary: a numerus clausus, restricting Jewish enrollment at institutions of higher education. 1920 October 12. Hope you like your picture? It isn't a bit posed, just as you stood he took it, very natural. There isn't much news to tell, you talk very little yet, but the things you do are more grown up, and there isn't a word you don't understand. When you see fresh fruit, you offer to kiss anyone, that means you want some if it too. You love to play, especially ring-around-the-rosy, with other children. And you can, and like to, fight. Especially with your young Aunt Ili. She is only six years older than you and loves you very much. You like to pat her, then when she stoops down to kiss you, you hit her and say "da, da." 1920 December 29. It's over three weeks since I wrote to your book, always waiting for something important to happen. Your vocabulary is large, every day some new words. Today it was "raining outside." Most of the words only Mom and I can understand, you talk so funny. Only when you want something to eat, or when you are mad for some reason you talk quite plain. But still you like to fight and hit people. You can slap real hard, your Mommy thinks it's amusing, but you never do it to me. Once you were crying and I imitated the way you cried. You got mad at me and lifted your little hand to hit me, but when you saw me looking at you, you came to kiss me instead. Otherwise you seldom cry, when you fall and hurt yourself you just ask us to kiss wherever is hurting, and won't do anything else, just a kiss, then everything is all right again. Still love to hide, right now you are playing with Mommy and you are under the table waiting to be found. Next best is ring-around-the-rosy, anybody in the room has to play it with you, if there isn't enough people then you take your teddy bear too. You love your teddy bear, go to sleep with it, feed it, and even put it on the potty. Mártuka, you are a very dear little girl, you give us lots of pleasure and help us to forget our troubles with your sweetness and laughter. Sometimes you do things you shouldn't, then I try to be serious and correct you, but in the middle as I look at you, I start to laugh, and have to hide my face so you can't see it. You think I am crying and you say "Daddy, no, no." * Bébi ("her real name is Violet"), six weeks younger than Márta, was the daughter of Matild's sister Margit and her husband Imre Ladner. † A téngerzemü hölgy (Eyes Like the Sea), which won the Academy prize in 1890. ‡ Where they had gone for a month's vacation. § Interpreted as "bad, bad"—possibly derived from daci, Hungarian slang for a bad mark in school.